I know, I know. It’s been YEARS (seriously, YEARS!!!) since I’ve written a post. A lot has happened since I last wrote, including our move into our new house in the mid-town Tucson neighborhood of Miramonte. We live in a beautiful (albeit small) 1950s adobe brick rancher, and have been making small improvements to the house and landscaping since moving in – including replacing all the outdoor plumbing, replacing all the windows, building a “greywater” drainage system for our laundry machine, installing a full drip irrigation system, and adding rock-mulch to the entire front and side yards. These have not been small tasks. One of my largest and most fun/interesting tasks (which has been consuming my time on and off since moving in) has been a slow renovation of our landscaping. When we first moved in, the front yard had some good (yet young) plants, but in general was just pretty dusty and felt a bit barren. The back yard had (still has) a beautiful green lawn and lots of fairly water-wise flowering plants – very manicured, but not particularly interesting. Although we haven’t made a lot of changes to the backyard, I have started a patio container garden full of succulents – mainly cactus plants. It’s actually become a bit of an obsession, trying to find the most interesting and strange desert-dwelling plants I can find. I go to all the local plant sales (one is even called the “Weird Plant Sale” at the Tucson Botanical Garden), and I have a few favorite nurseries and plant stores around town that I like to check out every couple of months. As my collection grows (and some of my finds have gone into the ground as well), I figure it’s time that I started to document my growing collection (in part so that I can keep track of the names of all my plants!). I mean really, who wouldn’t want to buy plants here? Anyway, this was about 2 years ago and while I was wandering around the cactus and succulent section I saw an older man putting the pot on display. It was the only one of its kind and it was overgrown in its container with offshoots (baby plants that grow from the base of the main plant). 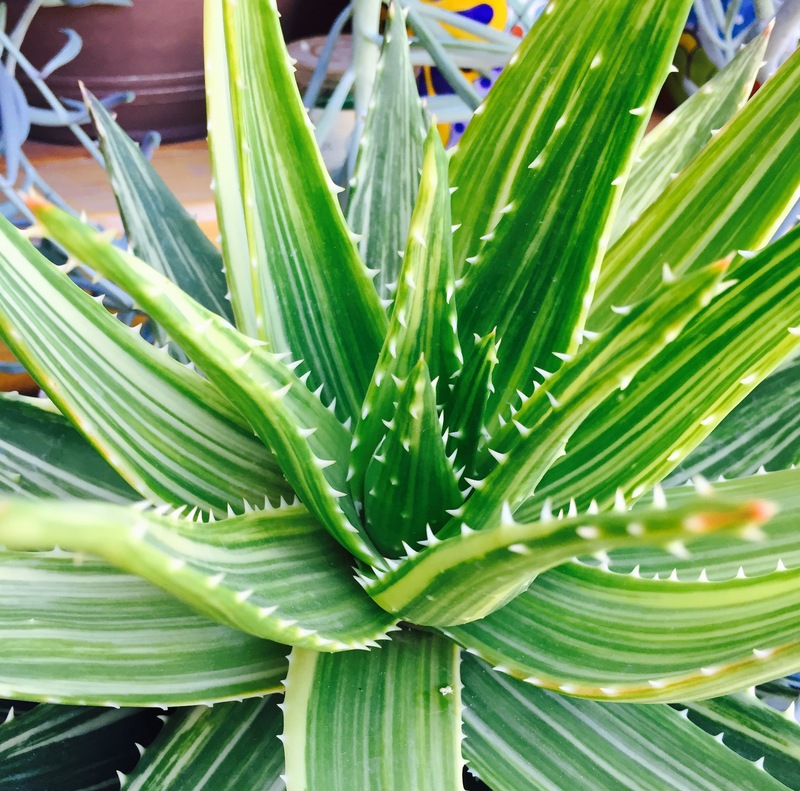 I looked at it for a few minutes and realized I’d never seen an aloe that looked like it before. Thus, my obsession with weird plants began. In the photo below, you can see some of the offshoots – each one of these can be pulled off and will become an adult plant that will then produce it’s own offshoots. In the two years I’ve had this plant, it has since multiplied and it now 4 separate plants – each of which is now mounding with new offshoots! 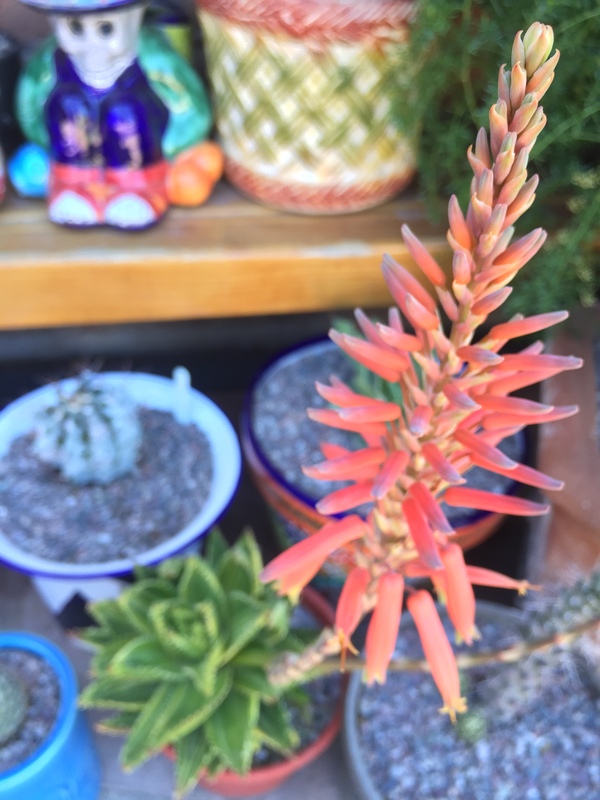 A better picture of this flowering aloe is included at the top of the post. So yes, this was the plant that started my collection. 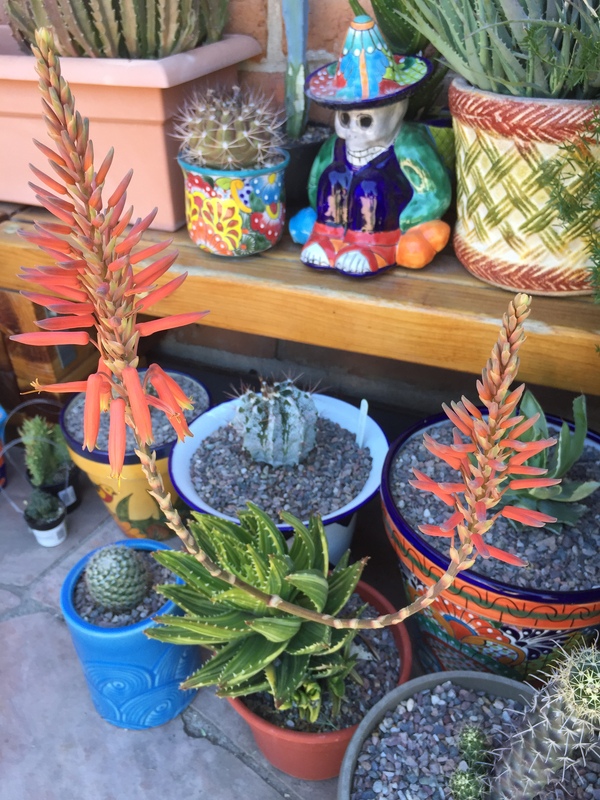 It was probably a good choice – aloes are easy to keep alive, don’t require much water, and most varieties don’t mind sitting in the scorching AZ sun – win for me! This blog is very interesting, Emily. I used to buy cacti for Denis’ office at Huckleberry as one of his windows faced the sun. He or the cleaning staff would forget to water his office plants but the cacti could thrive on the window sill and go for a long time without water. It was fascinating to see the flowers they sprouted from time to time. May you continue to enjoy your plants for a long time! Hi, very lovely plants. I was wondering if you could offer a word of advice, noting your success with repotting aloe. 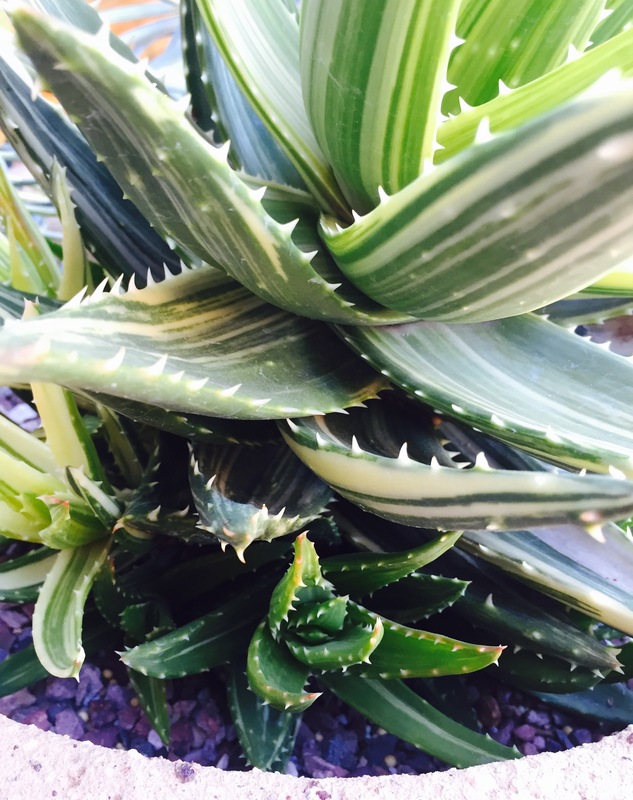 I was gifted an aloe vera (no idea of it’s age) for about a year that I repotted and it just took off – grew really big, strong, and produced about 5 pups in late summer. Over the winter, I noticed that summer harvests had made it kind of top-heavy and it leaned a bit to the side. A video by a professional aloe grower showed that when one seperates the pups from the mom, one can also reduce a top-heavy plant by cutting off the roots, peeling off a few of the older bottom leaves, and reinserting the stem into the soil to re-root over a few weeks. I’ve also seen and read of the same thing with other succulents. I figured Spring would be the best time to try this – new growth and all. The beheaded aloe is still ‘alive’ but it hasn’t rooted over the past month. The soil, an extremely well-draining mix of cactus earth & coarse sand, was kept dry for 4 weeks and only put out in the rain for about an hour yesterday. My questions are: have you ever heard of this method? If so, do you know of any success stories using this method? About how long does it take an aloe to re-root, if so? I do so hope you can help me and look forward to hearing from you. Thanking you in advance! Hello! I’m not sure if my advice will be helpful, but I’m happy to provide it 🙂 I’m actually quite familiar with the technique you described – it’s a very common practice when dealing with dry-land plants. In fact, lot of succulents can be successfully propagated through cuttings (and the same goes for pruning – like you’re doing – and/or saving a damaged plant). 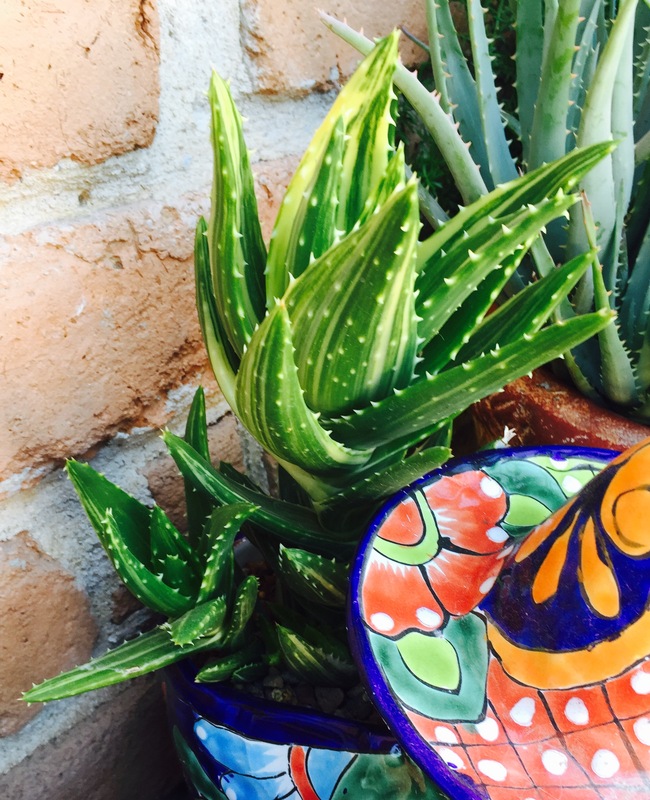 Although I haven’t done it with an aloe specifically, I don’t see why it wouldn’t work – it may just need more time, sun, or warmth – but if the plant still looks healthy it sounds like it will eventually shoot out some roots when it needs them. Wow, your response REALLY took a load of my mind – I thought I’d surely killed the poor plant! After writing you yesterday, I revisited the original video and realized that it took 11 weeks for his (much larger than mine) aloe to root but what a root ball it developed! Now that you mentioned warmth, I’m remembering other differences (he’s based in California and pruned in summer; I’m in Austria and it’s still spring).So leaving the plant alone is probably the best response. Thank you so much for your advice and time. Looking forward to seeing/reading more about your wonderful cacti garden & the development of the rest of the garden!